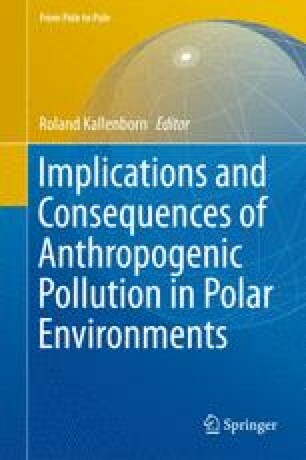 In addition to mercury (Hg), an array of chlorinated, brominated, and fluorinated persistent organic pollutants (POPs) have since the 1850s and 1940s, respectively, been transported to the Arctic where they accumulate in biota. The IPY project leaders were asked to review the information from BearHealth, and thus, we could not include all our coauthors in this review. However, we would like to acknowledge the excellent contributions from these colleagues, which all listed in the cited BearHealth references below. We also would like to acknowledge hunters from all participating circumpolar nations for collecting samples, colleagues, and staff participating in the field work, as well as laboratory technicians and colleagues participating in the laboratory and analytical work. BearHealth was funded by the Lundbeck Foundation, Danish Cooperation for Environment in the Arctic (DANCEA), the Commission for Scientific Research in Greenland (KVUG), the Prince Albert II Foundation, the Norwegian Research Council (project no. 175,989), the Government of Canada Program for International Polar Year Secretariat (project no. 2006-SR1-CC020), the Northern Contaminants Program (Aboriginal Affairs and Northern Development Canada), the Canadian Molson Foundation, and the Natural Science and Engineering Research Council of Canada.